The CDC considers the level of lead in blood elevated when it’s above the national mean, currently set at 5 μg/dL (micrograms per deciliter). The process of professionally removing lead is pricey, and maybe you just don’t want your kids living in a lead-containing home. Big Easy Buyers can help. More than 90 percent of homes in the NOLA area were built before 1978, when lead paint was banned nationwide, leaving most homes with some amount of lead paint. As a result, children in our area are more than twice as likely to have lead poisoning as children in the rest of the country. 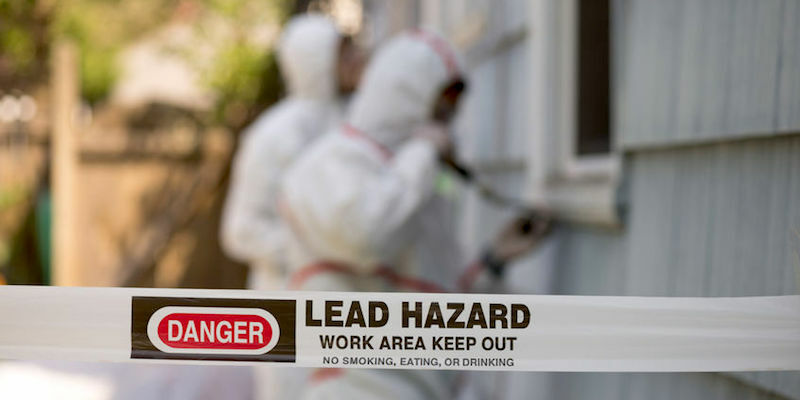 Here’s what you need to know about how to minimize exposure to lead in your home, how to deal with its removal, and how to sell a New Orleans home with lead, fast. Why is it such an issue in New Orleans? Most structures were built before lead paint was banned in 1978. Due to the subtropical climate, the heat and the humidity break the paint down faster (just think about how many houses you see around here with chipping paint). In the wake of Katrina and the rebuilding effort, a lot of contaminated dust escaped into the air and the soil. Children are exposed to lead in several ways, including breathing in lead dust particles inside a home and outside (from nearby renovation and construction sites), eating paint chips contaminated with lead, and drinking water that comes from lead pipes or service lines. No amount of lead is considered safe, but the CDC considers a level above 5 µg/dL in blood elevated and therefore dangerous. It is recommended that all children are tested for lead exposure at 12 months and 24 months. In 2003, children in New Orleans were seven times more likely to have lead poisoning than children elsewhere in the country. Due to the city’s efforts to address the issue, the current ratio is down to two times as likely, but it remains an important issue. Lead poisoning has been shown to cause behavioral problems, learning difficulties, lower IQ levels, stunted growth, hearing and speech problems, and hyperactivity. It can also lead to premature birth and, in severe case, death. The symptoms are irreversible and typically only show up after a child has had long-term exposure, so it’s important to test, and test early. The best course of action for removing lead is to have a local certified lead expert remove the paint per EPA guidelines. Don’t try to make the repairs yourself, including any construction or renovation work such as sanding, repainting, removing paint, or tearing down walls. This could make matters much worse and even render the house uninhabitable (in extreme cases). Before hiring a contractor, ask him or her to provide proof of certification under the EPA Renovation Repair and Painting Rule (RRP Certified). We buy New Orleans houses with lead paint. The process of professionally removing lead can be costly. Even if you have already removed lead from your home, or if your lead paint isn’t yet deteriorating, some folks just don’t want their kids living in a lead-containing environment. If this describes you, we can help. Big Easy Buyers will buy your house, in its current condition, lead paint and all, for cash. The whole process — from contact to closing — should take 30 days or less. If you need to sell your house with lead paint, contact us online or by calling (504) 513-7878.